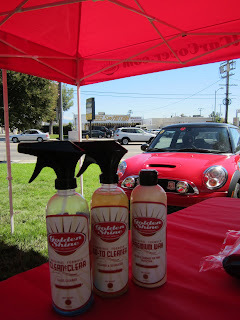 On Saturday we hosted our Mini Cooper Detail Day. The event was a lot of fun so thank you for all the local SCMM members for stopping by California Car Cover for the afternoon. One of our Golden Shine team members, Brandon, answered detailing questions and did product demonstrations on all of our Golden Shine products. One of the club members even drove her Mini under the canopy so that Brandon could demonstrate a clay bar and polisher on her vehicle. 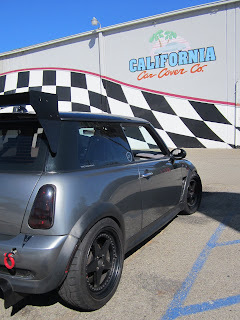 Photos of some of the Mini Coopers that stopped by our store. Special thanks goes out to Scott and the crew at Motoring Magic in Thousand Oaks, Ca. The shop specializes in Mini Cooper maintenance and is also a distributor of our Golden Shine products. We are hosting a showroom sale through the end of the month so it is a great time to save on garage items, car care, collectibles and more. A big thank you goes out to our vendors that donated items to the prize raffle for attendees. We had a catalog sign up station and gave away some great items to the lucky winners. Some of the Mini drivers walked away with Introtech Sun Shades, XPEL lens protection kits, Metro Vacuums, Mac Neil Weatertech floor mats and Lloyd custom floor mats. One of the lucky winners of a custom Introtech sun shade. Thank you to all the sponsors and attendees. We look forward to hosting another event in the spring. very nice presentation with attractive look. welcome to visit auto detailing products and detailing supplies.